A late breakfast followed by a dip in the rift valley inlet – that sounds more dramatic than the northern tip of the Red Sea – gave a tang to our late morning start. 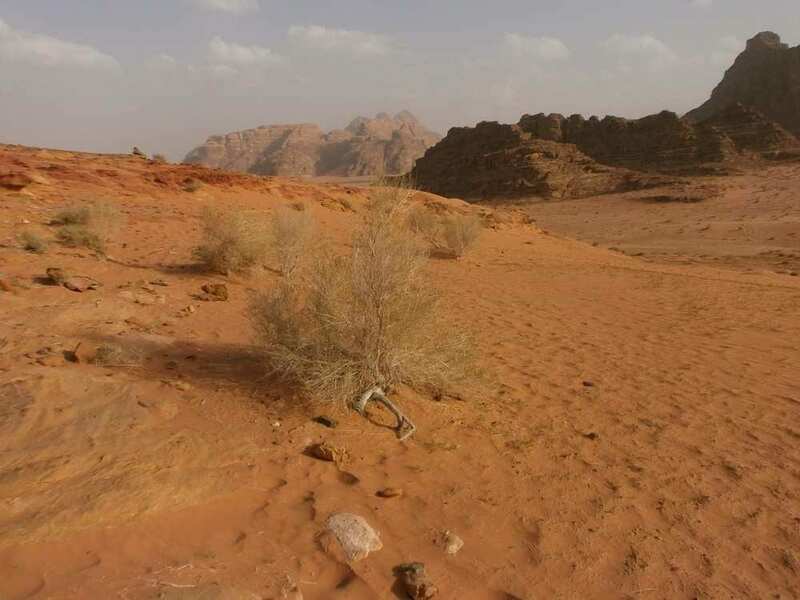 In the early afternoon our small coach set off westwards in the direction of Egypt, to Wadi Rum. lobby at ‘one thirty-five sharp’. He was very well informed. When I challenged his assertion that the word ‘wadi’ was the origin of our word for ‘valley’, stating that it came from Latin through Norman French into English, he said the Latin came from ‘wadi’. I didn’t find this origin anywhere on the internet but didn’t mention it. Instead I said the word ‘wadi’, spelt variously, is used in English for a dry valley formed by seasonal flood waters. I thought this would make him happy. He made no comment. By then we were passing over a flat desert to mountains on the horizon. The air was clear and crisp, though we could see scattered sandstorms in the distance. 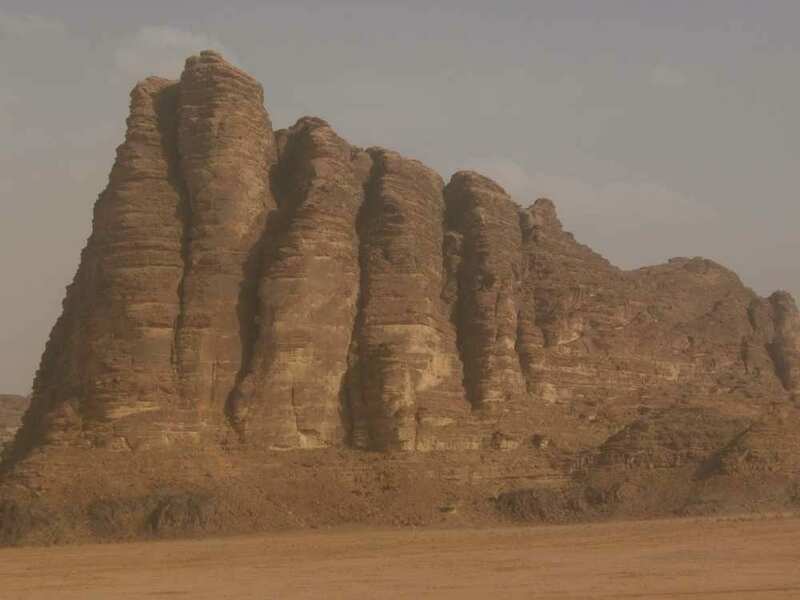 Then jagged mountains rose out of the flat desert floor and we stopped to pile into three 4-wheel drive vehicles right in front of the Seven Pillars of Wisdom – the land of the Bedouins and T. E. Lawrence. John was very excited. We had visited Lawrence’s post-Arabian haunts in the West Country and his grave. I felt as if I was slipping back into the boyhood of my father and grandfather, nourished on novels like Rider Haggard’s King Solomon’s Mines and R. L. Stevenson’s Kidnapped and Treasure Island, the world of Lawrence as well. Tales of adventure in exotic locations, heroism and a fascination with the way other people lived. After Byron, would T. E. Lawrence be an early example of a celebrity? changed as the afternoon sank into evening and stopped at a Bedouin camp. 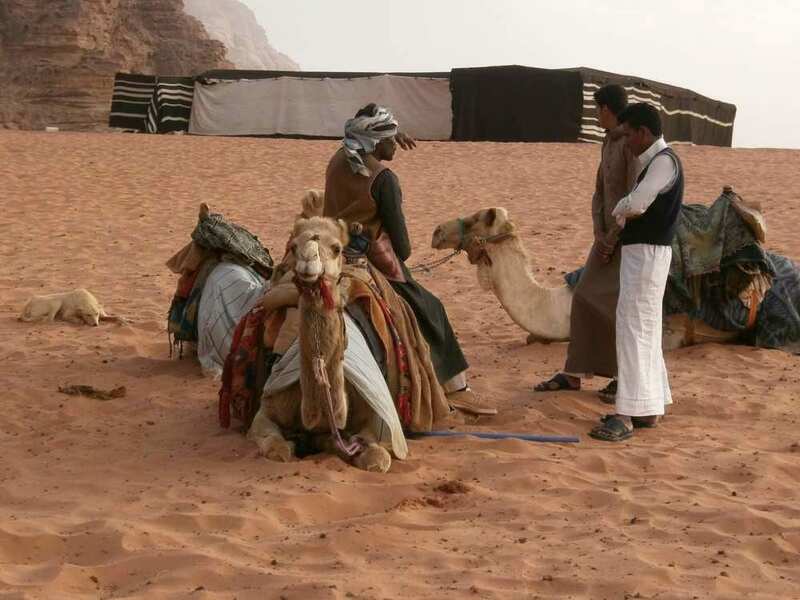 A caravan of camels crossed the desert in the middle distance, two groups of three, and at sunset a flock of goats, just as in the early 20th century, I imagined, as in Lawrence’s time. I looked up the gentle slope of dunes to the foot of the mountains and wanted to plant some fresh footsteps into the sand, the essence of adventure. Step off into the unknown where there are no traces to follow – in this case thanks to a recent sandstorm! 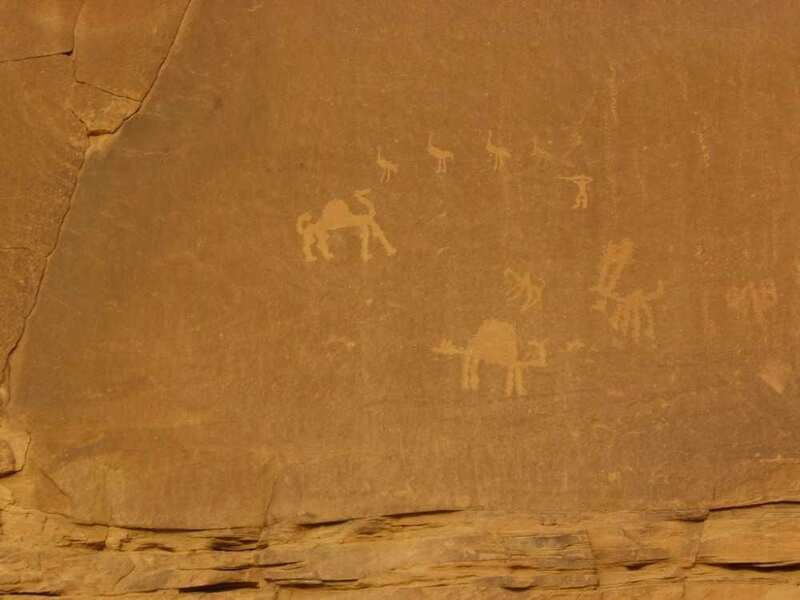 We saw ancient drawings scratched into the rocks – ancient or more recent? On a tall rock near another Bedouin camp, someone had carved relief portraits of Lawrence and his leader in the effort to forge an Arab state, King Faisal, who was also a friend. Under a dark sky speckled with stars we stopped to eat round a fire in a ‘Bedouin restaurant’, the only group in a large tent.